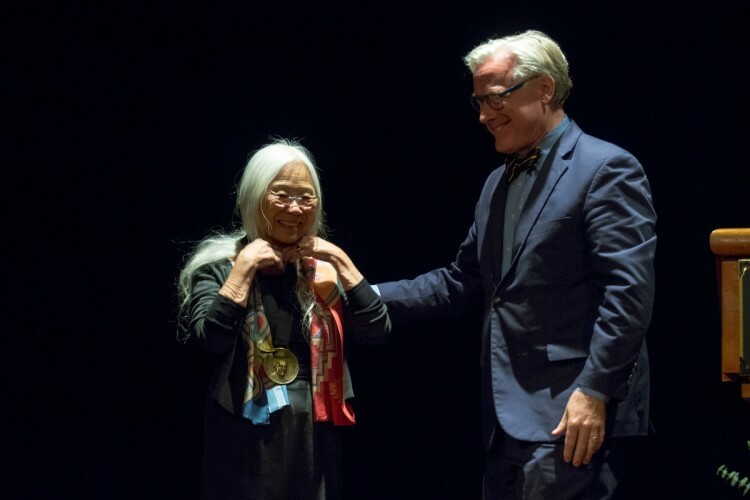 President Bradley W. Bateman presents the Pearl S. Buck Award to Maxine Hong Kingston. 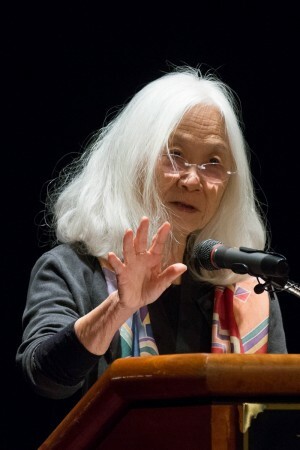 Distinguished and celebrated author Maxine Hong Kingston was officially recognized as the sixth recipient of Randolph College’s prestigious Pearl S. Buck Award during a ceremony in Smith Hall Theatre Wednesday evening. 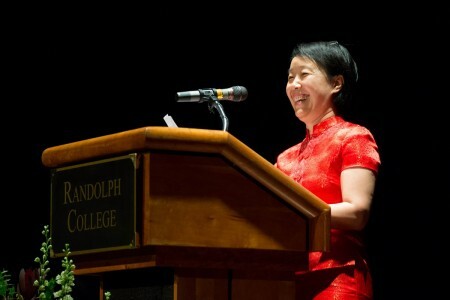 Kun An, Chinese language and Asian studies professor, welcomed guests at the award ceremony in English and in Chinese. 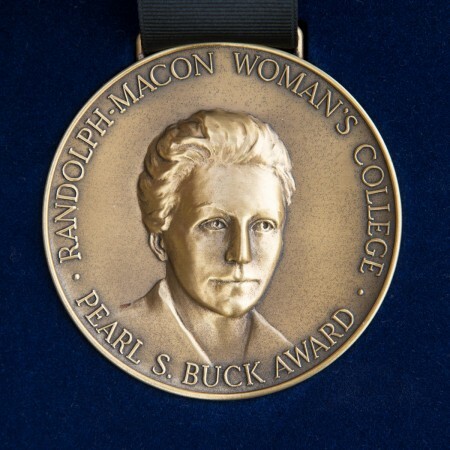 The Pearl S. Buck award is given to women who exemplify the ideals, values, and commitments of Buck, a member of the Class of 1914 and the first American woman to receive the Nobel Prize for Literature. Like Buck, Kingston has been a lifelong champion for peace and women’s rights. Her work is directly influenced by her mother’s childhood stories of China, as well as her own experiences as a first-generation Chinese American. Currently a lecturer emerita for creative writing at the University of California, Berkeley, Kingston is best known for writing The Woman Warrior: Memoirs of a Girlhood Among Ghosts, and its companion piece, China Men. The Woman Warrior won the National Book Critics Circle Award in 1976 for nonfiction, and China Men was awarded the 1980 American Book Award. In 2014, she was awarded the National Medal of Arts by President Barack Obama. She has also received the American Academy of Arts and Letters Award in Literature and the National Humanities Medal in 1997 from then-President Bill Clinton. Maxine Hong Kingston delivers her address after receiving the Pearl S. Buck Award. During her acceptance speech for the award, Kingston read passages from The Woman Warrior and The Fifth Book of Peace, a continuation of three books of peace that existed in ancient China but were lost in a fire. Kingston began writing a fourth book, which ironically was also lost in a fire in 1991. In the completed Fifth Book of Peace, Kingston describes the ways art can be used to promote and bring about peace. She closed by reading the especially powerful last passage from the book. Following Kingston’s speech, Eva Heitbrink ’17, Randolph Student Government president-elect, recited one of Pearl S. Buck’s most powerful messages of peace and the inherent good within people. “Women like Pearl S. Buck and Maxine Hong Kingston have used their literary talents to share stories of others—stories that have opened the eyes of the world to those of difficult cultures and backgrounds, and stories that have helped us understand our history in order to better our future,” he said. The presentation of the Pearl S. Buck Award is part of a nearly yearlong celebration of the College’s 125th anniversary of its founding. More anniversary events can be found at http://web.randolphcollege.edu/125/. 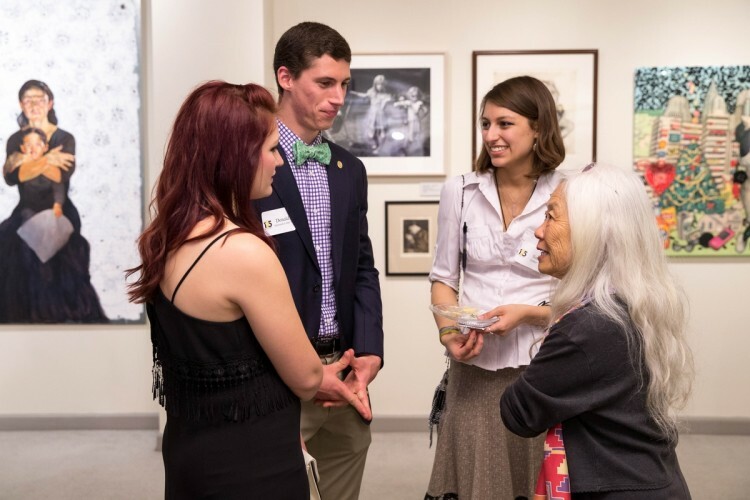 Maxine Hong Kingston meets with Randolph students at a reception at the Maier Museum of Art at Randolph College prior to the Pearl S. Buck Award ceremony.